Alright, alright, alllllriiiiiight! You gon' learn today! Comedian Kevin Hart is coming to Atlanta's Philips Arena and Augusta's James Brown Arena as part of his 45-city What Now? Tour. Tickets go on sale 20 February 2015 at www.whatnowtour.com for the shows to be held, 12 June and 14 June. Hart, one of comedy's biggest stars, was spotted often in Atlanta during the filming of Ride Along. The motion picture, which also starred Ice Cube, made $154 million at theaters. Ride Along 2, also filmed in Atlanta, is scheduled to be released in 2016. 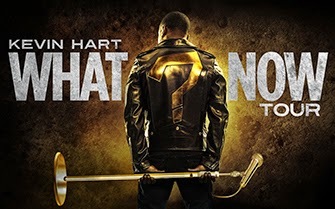 In 2012, Hart was tapped to host the 2012 MTV Video Music Awards, garnering much industry praise for his appearance. His comedy tour Let Me Explain took him to 90 American cities before hitting countries throughout Europe and Africa. A testament to his talent and popularity, Kevin became only the second American in history to sell out London's O2 Arena. In addition to sold-out tours, Kevin's film credits also include Top Five, Think Like A Man Too, About Last Night, and This Is The End. Promoted by Live Nation, the biggest comedy tour in history kicks off on April 9, 2015 in San Antonio, Texas at AT&T Center and includes dates at New York City's famed Madison Square Garden as well as a stadium date in Philadelphia, Pa. at Lincoln Financial Field.